The age of heroes is dead, and the bridge to glory is broken—Bifrost fell long ago. The world is lost in an age of war, of dark wilderness and lost empires sunk beneath the waves. Only magic and the warmth of hope keep lights aglow when dread things prowl and the priestly wardings shake, bent by hideous otherworldly rage. In this dark time, heroes must arise to claim the crowns of Midgard and restore the jewels to her scattered thrones. New heroes must lead a return to glory! At first glance the Midgard campaign setting might seem familiar, flavored with a strong dose of European and Middle Eastern mythos, a medieval level of technology, and races taken directly from the greatest fantasy traditions. Dig a little deeper, and you’ll find some surprising twists that take Midgard from standard fantasy to exceptional vision. These seven foundational mysteries provide a quick summary for the game master (GM) who wants to plan out a short campaign or a long arc. The flat world of Midgard floats in a vast space of living stars. The heavens are accessible to great heroes who dare to visit them, by climbing a tower into the heavens or sailing to enormous heights on Void dragon wings. A great serpent surrounds the world, or so claim those few travelers who have been to the edge of the world. What lives underneath? No one knows for sure. Midgard is not a modern world dressed up in a few medieval bits of armor and weaponry. Midgard makes the mythic real, with a world to explore from edge to edge. The dragons of Midgard correlate to the elements rather than to colors and metals (though all the traditional dragons are present). They obey an urge to power and rulership, and they exercise that rule through an entire empire that carries their name. All dragons seek to rule their provinces and to carve out power, the better to amass treasures. As their willing servants, dragonborn, kobolds, and drakes are rewarded with lands and wealth of their own. The dragons of Midgard have no interest in sitting in a lonely cave, counting coins. Their greed makes them ambitious, and that ambition makes them extremely dangerous. They do not wait survey the land, knowing it is all theirs for the taking if their claws are strong enough to hold it. The Midgard pantheon has needs, and the urge to meddle. The gods dispense spells and miracles to their faithful, but they make clear demands of their worshippers and priesthoods. The gods also argue, sire children to rule kingdoms, and foment wars and feuds. Divine murder and enslavement are possible, and this is part of the reason why the gods of Midgard wear masks (see chapter 12). Their hatreds and rivalries spill out from the heavens and into the mortal streets and kingdoms. Every deity has distinct goals and desires, and they specify what they expect of their followers. The Midgard campaign features the traditional humans, elves, and dwarves as well as new races, including the ravenfolk, minotaurs, kobolds, dragonborn, and trollkin. These races had a place in the world from the start, their ambitions leading to the founding of unique kingdoms. Concealed races still hide in the corners of the world to surprise players, such as the intelligent, ghoulish darakhul, the feral catfolk of the Southlands, and the mysterious winterfolk. Humans are the most numerous people and their kingdoms are grand, but Midgard offers many flavors of nations and a wide range of heroes and villains. The land is alive with ley line magic, and some know how to harness that power for spellcasting and magical travel. The elves used the magic of ley lines (see “Ley Lines” on page 38) to create and sustain the shadow roads (also called the fey roads), making it possible to connect a far-flung empire. When the elves retreated from the world, their roads remained, and humans and the shadow fey learned to tap into the ley lines that sustain this magic. Player characters and villains alike can use these wellsprings of power, which flow invisibly everywhere— though the most powerful ley line conjunctions are warded or guarded, used as the foundation of great fortresses or thriving cities. In Midgard, you can increase the level of magical power to unheard-of levels, without destroying the reality of the setting outside those ley line conjunctions. Midgard is a world of cultures designed to change, collapse, and grow over time—and in this new edition of the setting, some of those changes have come to pass. Borders have shifted, crowns have been seized or restored, and cities have been plundered or rescued from ruin. 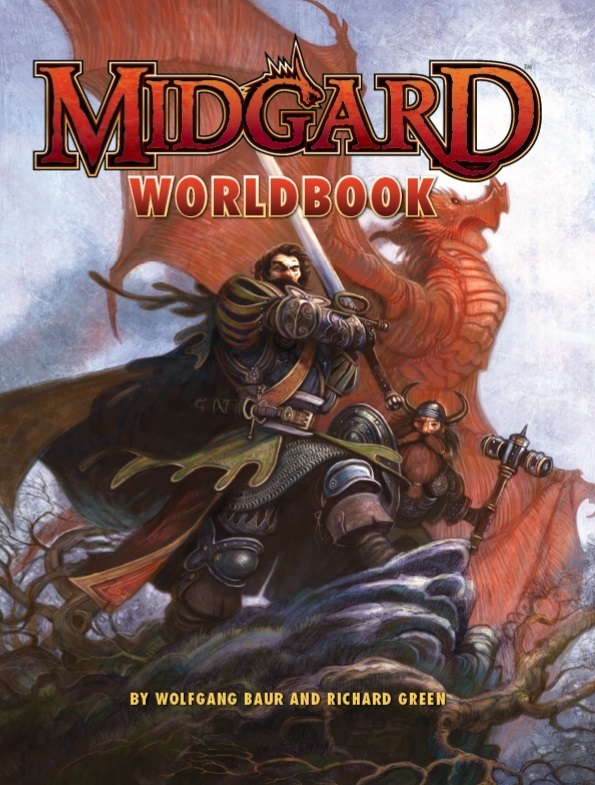 Midgard is a setting intended to change after every adventure; the work of the heroes in Midgard challenges the existing order, gives rise to great new lords and ladies, or sees the failure of hope and the death of kings. The results of some of the last five years of play and development have been integrated into the world, both in Zobeck and farther afield. There’s no point to playing a game where nothing changes but the statistics on a player’s sheet. As GM, you can and should take advantage of the inherently unbalanced politics or dangerous triggers built into the setting. Those ancient curses and festering revolts are there for your campaign. Find out whether your players have what it takes to change things—for better or worse! Two optional rules make Midgard special. The Status rule (see “Optional Rule: Status” on page 25) gives player characters a type of advancement linked not to level, but to their prestige and renown. The social status of PCs makes a difference in who they can visit and how they are treated— not that important in most dungeons, but possibly vital in the Court of the Imperatrix of Dornig, or when trying to counter a Dragon Empire ambassador’s plots. Similarly, the Time Flies optional rule advances campaigns quickly, so that months and years can fly by, and events of a campaign roll out at a less hurried pace. Generations can rise and fall, and adventurers can see their careers as a long arc rather than a brief set of fireworks. With those points in mind, let us draw back the curtain on the world and its people. It is a place of great danger and a few flickering lights, holding out against a tide of darkness that threatens to engulf all lands in a new age of horrors and barbarism. Midgard is a place in need of help, where a few stout hearts can turn the tide, or a few bad decisions can plunge a kingdom or an empire into bloody ruin. Let’s start at the beginning with the creation of the world, as told by several of its great races, the dragons, giants, dwarves, elves, and humans. All races agree the world is flat, with a single sun, one major moon, and six planets. Beyond these facts, the details of Midgard’s origins are shrouded in mystery. Almost all the gods and giants and other powers claim to have created the world. Some of them must be lying, and likely all of them are. The most common tale is that of the Northlanders who say that in the beginning, before Midgard was created, there was only the endless Void called Ginnungagap. At one extremity of this vast abyss was biting cold; at the other, raging fire. How did the Void become the world? That is a matter of theology, arcane ponderings, and bardic mysteries.